welcome to my brain . net: Why is this becoming a theme with me? Why is this becoming a theme with me? We're at a smaller church. So, I got really excited at the idea of actually making something personal for each of the homebound members when I go to visit them the first time. There have always been too many in the past, and when the kids would visit a nursing home, they would either make something simple for them out of construction paper or just take books and read to the residents. We had to plan for about fifty people each time. Well, now I can focus on one home a week. I wanted to crochet something that they could have and keep and know that their pastor's wife was thinking of them ... while she was making it ... BINGO! I'll crochet something. Here was my first attempt at the whole crochet-with-thread thing. Why does this keep happening to me? It's supposed to be a bookmark with a pineapple at the top (such a classic sign of hospitality - good idea, huh?). However, this doesn't look like a pineapple ... does it? Not even a bookmark. Nope. We all know what this looks like! "Frank, the darndest thing happened today. That new preacher's wife came by and gave me a crocheted sperm ... told me I could put it in my Bible. Just what exactly is going on up at the church these days?" I can't stop laughing. I think it's the quotation from the lady to her husband that still has me laughing. You are a ...beyond words. Thanks for the biggest giggle I've had all week. I miss you Christine Moers!! I like the pictures of the pumpkins. Hmm, what would Freud say about all these sperm that you keep creating? HAhahahahahahaha! 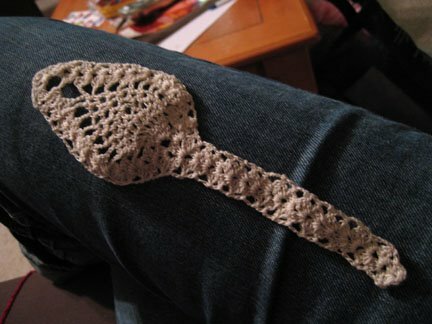 I must try crocheting some sperm bookmarks myself. Of course, if I were trying for sperm, they'd probably turn out looking just like palm trees or something. VERY funny!! You ought to see what you can get for it on ebay. I love it! It looks like a pie server thingy. Every sperm is sacred. . . I'm mainly in shock that you have time to crochet sperm and present them to shut-ins when you've only just moved to an entirely different state and home. Are you a whirling dirbish of energy or just that servant oriented. Amazing. :) Maybe you should attach a church slogan like 'Impregnating the community with God's Word' or something along those lines. Grew up at 1119 West College, and my Grandparents lived in the Heights and attend Heights Baptist Mission Chruch. I'm stumbling through your old posts, laughing my patooty off!